TV with Thinus: SAfm listeners slam Hlaudi Motsoeneng as an illiterate dictator, while the controversial SABC boss berates Sakina Kamwendo on-air: 'You need to talk like SABC employee'. SAfm listeners slam Hlaudi Motsoeneng as an illiterate dictator, while the controversial SABC boss berates Sakina Kamwendo on-air: 'You need to talk like SABC employee'. Furious listeners on Wednesday morning vented their anger at the SABC's Hlaudi Motsoeneng with several calling him a dictator, while the controversial boss who struggled to answer basic questions, disappeared after a break. Hlaudi Motsoeneng's disastrous SAfm interview (listen to it here) is his latest cringe-worthy live interview after he was attacked three weeks ago by LotusFM listeners, made shocking remarks on eNCA's Maggs on Media on Sunday where he slammed media experts for knowing nothing about journalism, and appearing on JacarandaFM on Monday in another mind-boggling interview with Rian van Heerden. The belligerent chief operating officer (COO) of the SABC who banned visuals of public protests on SABC TV News was supposed to be the guest on SAfm for an hour of The Forum at 8 but was gone after a few callers voiced hefty criticism to suddenly attend to an "emergency" according to presenter Sakina Kamwendo. As he did on LotusFM, Hlaudi Motsoeneng suddenly berated Sakina Kamwendo live on-air when she asked him basic questions regarding his SABC News censorship decisions that he struggled to answer. "This thing of intimidating, suppressing the workers there in SABC, it will end. He took away The Editors on Sunday. It's dictatorship," said COPE spokesperson Dennis Bloem. 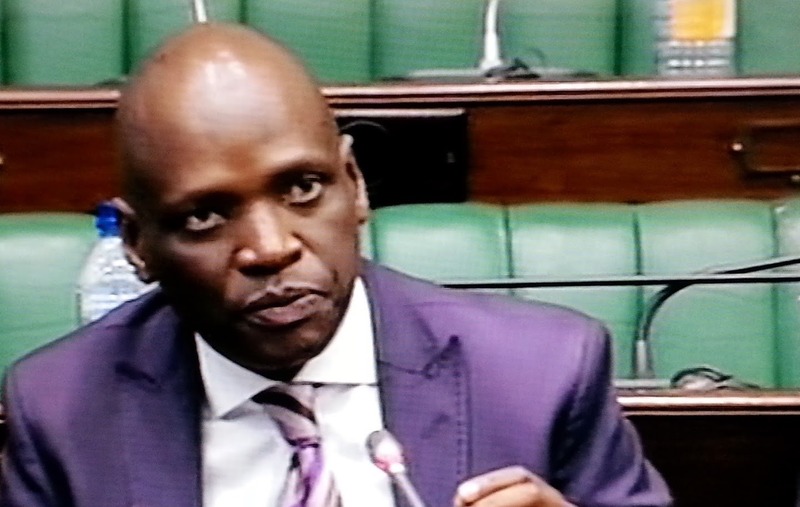 Hlaudi Motsoeneng said "SABC can't show visuals that can harm the community". He attacked Bloem, saying "Dennis Bloem is not a leader. I don't know who'll vote for Dennis Bloem. He's also a parent. I don't know what kind of parent he is". When Sakina Kamwendo asked Hlaudi Motsoeneng if his new censorship decision meant that the SABC has always been contravening the Broadcasting Act, he berated her on-air for her questions. "Sakina, when you talk there, you need to talk like SABC employee. You as SABC people need to know what the SABC policy is saying. It is important for you as journalists of the SABC to represent the public, to represent the SABC". "In any editorial newsroom in South Africa, when journalists sit down and discuss stories, they just discuss negative stories. Even at the SABC. I said 'That can't happen' and I'm not apologetic about it." A listener slammed Hlaudi Motsoeneng for his "autocratic style", another one said "our Sesotho radio, LesediFM, has been turned into a clown. It's only clowing there". Unathi said "Hlaudi wants to do the very same thing that was done by the Apartheid government. And I will not be surprised if I read in the media in the next few days that you [Sakina Kamwendo] have been removed as a journalist or host of this show because this guy is a dictator. He can't dictate to us as a nation what visuals we must see. If a person does not want to see visuals, he must change the channel." By 8:35am, after a barrage of caller criticism and probing questions by Sakina Kamwendo, Hlaudi Motsoeneng was suddenly gone. "This morning on The Forum at 8 we were meant to host Hlaudi Motsoeneng to engage, to unpack the corporation's vision for the future and also to answer some of the questions you've been posing to us that we have not been able to answer," she said. Eddie from Odendaalsrus said "the man has gone too far. Hlaudi most stop behaving like a politician". Ithumeleng in Mahikeng said "please Sakina, I heard Motsoeneng, I'm worried because he was getting angry as you went probing and probing. Be careful when you speak to these guys, tomorrow you might not be sitting in that chair". Vincent in Cape Town also slammed Hlaudi Motsoeneng's “dictatorship mentality" and said: "I've been hearing everyone calling and disagreeing blatantly with everything Motsoeneng is doing. When kids go to school in thousands they see their schools burnt. So it doesn't matter if SABC airs it or not, they are affected by schools that are burnt". "You can even see when you interviewed him, he has a dictatorship mentality. He was opposing everything that you were saying, instead of listening to the facts and addressing the facts. He's attacking the person holding the ball, not the ball". Alex from Johannesburg said "the banning of protest images is intellectually bankrupt" and that "the SABC is screening violent movies. Very violent American movies. The point that they're making about violence is not consistent with the total programming when you watch SABC television".